The Preferences palette contains settings for many ZBrush features so that you can set them to suit your working requirements. After changing settings the new configuration should be stored by pressing the Store Config button in the Config sub-palette or Shift+Ctrl+i on the keyboard. Preferences adjustments are not saved automatically. 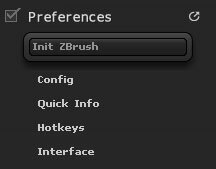 Initializing ZBrush resets the interface and palettes to their default state, clearing data including customized tools in the Tool palette. You should save you work before pressing this button.